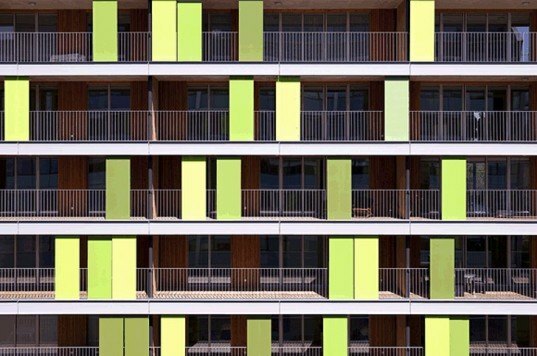 The Bamboo Residence is a colorful energy-efficient apartment complex located in Geneva, Switzerland next to The Coral House. Designed by Group8, the residence is green in color and features a great array of sustainable building strategies. The airy apartments take advantage of passive building strategies and renewable energy generation to control climate and energy costs effectively and efficiently. Along with Group 8’s Coral House, the Bamboo residence was part of a plan to redesign the former industrial neighborhood of Chandieu into a residential area with public and private green spaces. A public square with a fountain and sculpture by Fabrice Gygi will complete the new neighborhood. Inspired by grass, the Bamboo is clad with flecks of green “pixel” brise soleils made from tinted glass that give privacy to the apartments’ balconies, while providing a punch of color and pattern to the façade. Each apartment is wrapped with floor to ceiling windows, allowing for natural ventilation and cross breezes within the apartments. The windows themselves are “breathable”- meaning they are double glazed with thermal breaks, with a third glass pane to allow airflow. The six story building meets the Minergie standard – a Swiss sustainability brand. The combined insulation, ventilation, floor cooling system and geothermal heat pump help the building reach optimal energy efficiency. Each apartment enjoys a private balcony, with sliding tinted glass panels to adjust privacy and sun. The ground floor apartments open to private grassy lawns and gardens. Before the apartment complexes were built, the area was cleaned and purified of asbestos and hydrocarbons, left from the former industrial buildings that filled the area. When the fountain square is complete, Chandieu will have made its transformation into a comfortable residential area. Along with Group 8’s Coral House, The Bamboo residence was part of a plan to redesign the former industrial neighborhood of Chandieu into a residential area with public and private green spaces. A public square with a fountain and sculpture by Fabrice Gygi will complete the new neighborhood. Inspired by grass, the Bamboo is clad with flecks of green “pixel” brise soleils made from tinted glass, which give privacy to the apartments’ balconies, while giving a punch of color and pattern to the façade. Each apartment is wrapped with floor to ceiling windows, allowing for natural ventilation and cross breezes within the apartments. The windows themselves are “breathable”- meaning they are double glazed with thermal breaks, with a third glass pane to allow airflow. 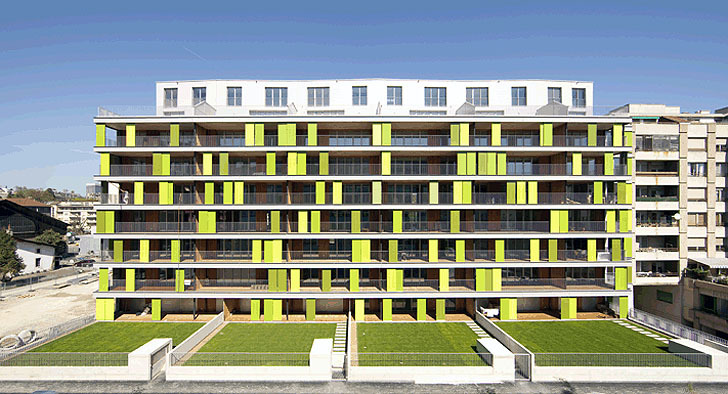 The six storey building meets the Minergie standard- a Swiss sustainability brand. The combined insulation, ventilation, floor cooling system and geothermal heat pump help the building reach optimal energy efficiency.